If you’re the sentimental type of bride, you’ve likely wondered how to keep your bouquet long after the wedding. You could have your bouquet and boutonniere preserved at a place like Inspired by You, or you might want to consider skipping live blooms altogether. 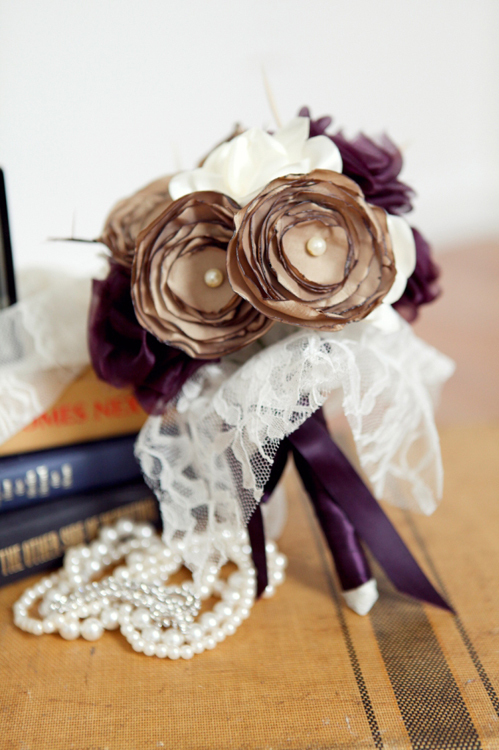 If having “something old” at your wedding is important to you, one of Maggie Joos’ designs might be just the ticket. “I prefer to work with something that already has a story,” Joos says. “That means brides trust me with their mother’s wedding gown, grandma’s collection of jewelry or anything special that would mean a lot to be included.” Since she does most of her work with Wisconsin and Illinois brides, it’s likely no surprise that she’s incorporating feathers from a bride’s chickens into her winter-wedding bouquet, for example. It was actually an heirloom piece that got Joos into this field. Not wanting to spend loads on fresh flowers, she got the idea when her mom gave Joos her wedding gown and veil. “When I told friends I was going to use her veil to create my bouquet, they chided me, but once they saw the final product, they told me I had to go into business,” she says. So she did, and now offers her wares on Etsy and at bridal fairs and businesses (such as High Brow Waxing Boutique) near Milwaukee, where she lives. 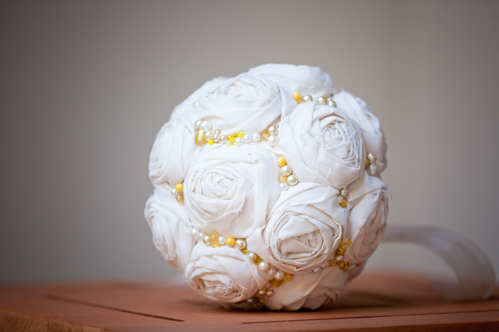 Maybe a vintage-inspired fabric bouquet would befit your wedding. If so, take a look at the creations at Ellarye Boutique, crafted from different types of fabric, pearls and rhinestones. First, designer Emily Krenzke forms the flowers that make the silhouette. Then the fun part: “I get to layer and shape the bouquet, and sprinkle on lots of pearls, rhinestones and beads,” explains Krenzke, a Racine resident. Krenzke’s always looking for one-of-a-kind “ingredients” to add to the bouquets she sells in her Etsy shop. “I am constantly sourcing the Internet and even local craft stores for unique and beautiful supplies,” says Krenzke, who went into business making fabric flowers for headbands in June of 2011, but started designing made-to-order bouquets for brides and bridesmaids this March. Ellarye Boutique bouquet photos courtesy of Jim Colman Photography. Ask Fen Li to estimate how many beads she incorporates in her romantic French-beaded bouquets, she’s got an answer at the ready: “A gazillion,” she tells me. And she seems to be right on the mark. Dating back to the 15th century (and 10 years ago for Li), the technique involves stringing seed beads onto wire, which is then bent into petals, blossoms and stems. “My first bouquet took me about six months, on an off,” Li says, which explains the lead time she needs from clients, who live from Wauwatosa to New Zealand, purchasing on Etsy and in local shops, like Miss Ruby Boutique. 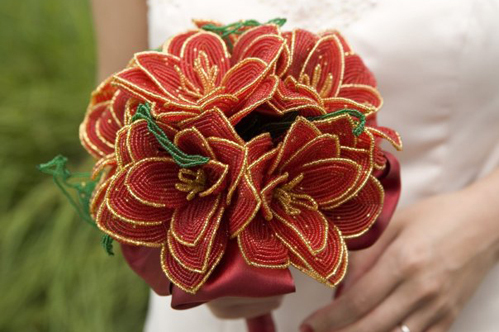 Li beaded the crimson and gold flowers for her own wedding. 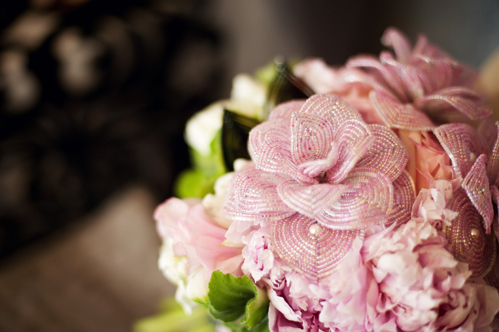 “‘I do beaded flowers,’ I thought, ‘so, I’ve got to have beads at my wedding, not just regular flowers. It wouldn’t be me.’” In a little less than a year, Li, who’s from Waukesha, beaded bouquets for herself and her bridesmaids, a boutonniere and 10 centerpieces. “It was crazy,” she muses. 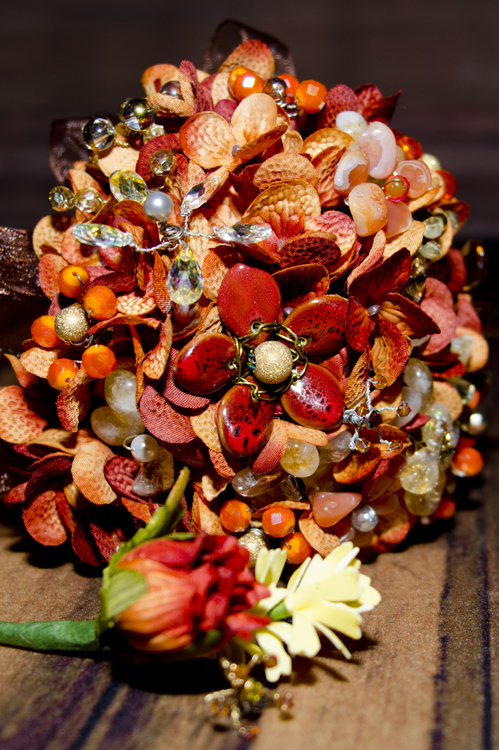 If an all-bead bouquet isn’t what you have in mind—or if the price, which can exceed $1,000, isn’t in your budget—take a cue from many of Li’s clients and add a few beaded blooms or leaves to an arrangement of flowers. “Sometimes, a beaded bouquet can look kind of hard,” says Li, “but if you incorporate some soft components, like the fresh flowers, it brings it all together.” To weave a beaded theme throughout the wedding day, brides use Li’s individual flower and leaf creations everywhere from the boutonniere and centerpieces to maids’ hair and the cake. “Even though they’re different types of items, they can be made in the same color scheme,” she says of the pieces that can cost as little as $6.50 apiece. Though she’s a longtime jewelry maker, Gloria Witt didn’t start creating alternative floral arrangements until she had to, when she and her now-husband were planning their wedding at Milwaukee’s Pabst Mansion. “They did not allow fresh flowers at that venue, and I didn’t want just silk bouquets,” she remembers about her November 2011 wedding. “With all the twinkle lights in the mansion, I wanted the Swarovski crystals, citrine and crystal quartz to catch the lights from all the decorated trees.” One night, she dreamed of the bouquet she had to have. After a fruitless search, Witt turned to her mom and nephew, who also work with precious stones, and they helped bring her vision to life. Since then, Witt has tweaked her method, but the components remain basically the same: high-quality silk flowers, semi-precious gemstones, Swarovski crystals, beads, brooches, antique buttons and more. “Some of my favorites to add to bouquets are citrine, crystal quartz, turquoise, and I am currently working on one with fluorite that I am very excited about!” says Witt, who has “bins and bins and bins” of materials. Together with her husband, Witt has opened a shop in downtown Hartford, where their photography, artwork, plants and jewelry—along with some of her bouquets—can be found. 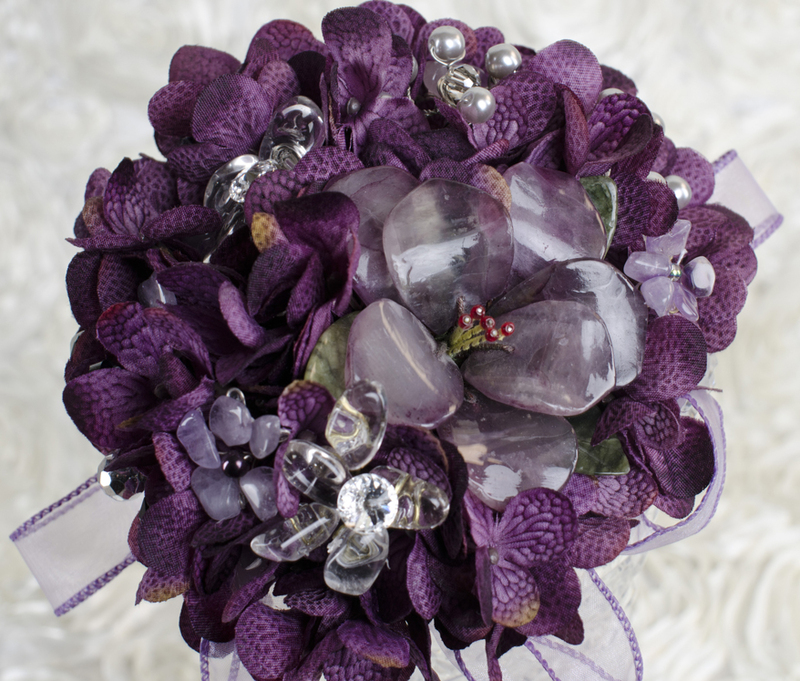 The bouquets are also on Etsy and cost from $100 to $500. It all depends on the components, she explains. 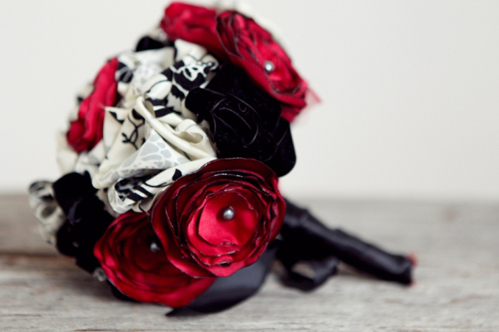 So, which type of bouquet will you choose? Share below!